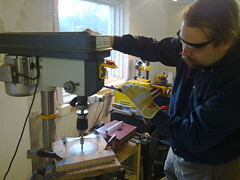 Making a hole for the main lens. The small central hole was used to align all boards for threaded rod holes and as a guide hole for the cutter tool. Everything should be fairly well centered for getting the measurements right for the actual OTA.